DR3-G12 used in road construction. MR3-W11 silt fence used in new construction. MR2-LW11 2′ X 100′ Woven fabric with 11- 1 1/4″ X 1 1/4″ X 3′ nom. hardwood stakes 50 20 Lbs. MR3-LW11 3′ X 100′ Woven fabric with 11- 1 1/4″ X 1 1/4″ X 4′ nom. hardwood stakes 50 27 Lbs. X 3′ nom hardwood stakes 50 22 Lbs. MR3-W11 3′ X 100′ Woven fabric with 11- 1 1/2 X 1 1/2 X 48″ nom. hardwood stake 50 30 Lbs. MR2-HW11 2′ X 100′ Woven fabric with 11- 2 X 2 X 36″ nom hardwood stake 50 28 Lbs. MR3-HW11 3′ X 100′ Woven fabric with 11- 2 X 2 X 48″ nom hardwood stake 50 40 Lbs. 1 1/2 X 48″ nom. hardwood stakes 50 35 Lbs. nom hardwood stake 50 31 Lbs. 14 GA. wire 32 27 Lbs. 12 1/2 GA. wire 27 39 Lbs. 12 1/2 GA. wire 50 58 Lbs. NR3-G12 3′ X 100′ Non woven fabric attached to 2 X 4 X 24″ 12 1/2 GA. wire 27 39 Lbs. MR3-GW13 3′ X 100′ Woven fabric with gal. wire attached to 13- 2 X 2 48″nom. hardwood stake 25 50 Lbs. MR3-PHW11 3′ X 100′ Woven fabric with plastic netting attached to 11- 2 X 2 X 48″ nom. hardwood stake 18 45 Lbs. 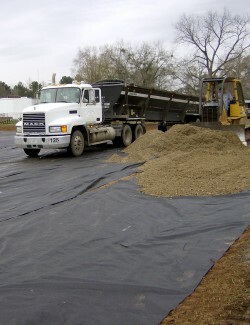 MR3-100 silt fence used with an existing barrier fence. To install pre-assembled silt fence, drive stakes on site, backfill, and compact. Simply unroll, stretch and continue to drive stakes. Note: If possible, silt fence should be installed in a 6″ deep trench to prevent sediment flow underneath the fence. Make sure that all supporting posts are on the down slope of the fencing.